Where do I start when it comes to describing this fantastic day! As a wedding photographer it was everything I could have hoped for and more. From beginning to end the day ran perfectly, with preparations held at the atmospheric Churston Manor followed by the ceremony, which was held at Lupton House mansion based in Brixham, with afternoon tea and the reception to follow. Rachel looked stunningly beautiful, wearing an embellished Rosa Clara wedding dress, with 1950's classically styled hair, a coordinating head piece and earrings to match, not to mention the beautiful long veil which seemed to stay perfectly in place throughout the day and which worked brilliantly in some of the styled photographs (Paul you looked pretty sharp too!). Romantic, elegant and thought to be the inspiration to Jane Austin's Barton House in her iconic novel Sense and Sensibility, Pynes House sits quietly on its own 37 acre private Estate in Exeter and this May was host to Rachel and Tom's beautiful Spring wedding. As a wedding photographer I am regularly offered the opportunity to visit and photograph some of the most beautiful venues in the country (in my opinion) and Pynes House is no exception which is why I am honoured to have been recommended by them as a photographer and to have been chosen by Rachel and Tom to cover their beautiful Devon wedding, which was so thoughtful planned. Emma and Ian married on an Idyllic summers day at The Millbrook Estate in Devon this May. As an elopement wedding specialist I have come to learn that not everyone who chooses these beautiful low key weddings, love having their photograph taken. To get the best wedding photographs at an elopement wedding I always feel it is important to arrive a couple of hours before the ceremony. Last month in April I was invited to cover the Exeter Living awards ceremony, held at The Great Hall at Exeter University, where some of Exeter's best business's came together to accept their accolades and enjoy an evening of banquet dining and fine wine at this stunning black tie event. Below is a preview of some of my favourite moments. Keep your eyes peeled this summer for Exeter Living magazine which is set to feature more on this event! When wedding photographers go on holiday they don't stop taking pictures. It's sometimes very difficult to put down the camera and stop ourselves photographing all of the pretty things we are affronted with and it's a bit of a curse at times! This month we took our first ever, 'family holiday' to Cornwall, with our 2 year old. We were given amazing sunshine, and perfect clear blue skies throughout, it really was magic. Our final day offered up a spot of cloud, which presented perfect conditions for a walk around a beautiful old fishing village called Mevagissey, set in the South of Cornwall, neat to St. Austell. I loved everything about this small, relaxed family wedding, which took place at the luxurious Tree Top Escape this winter. 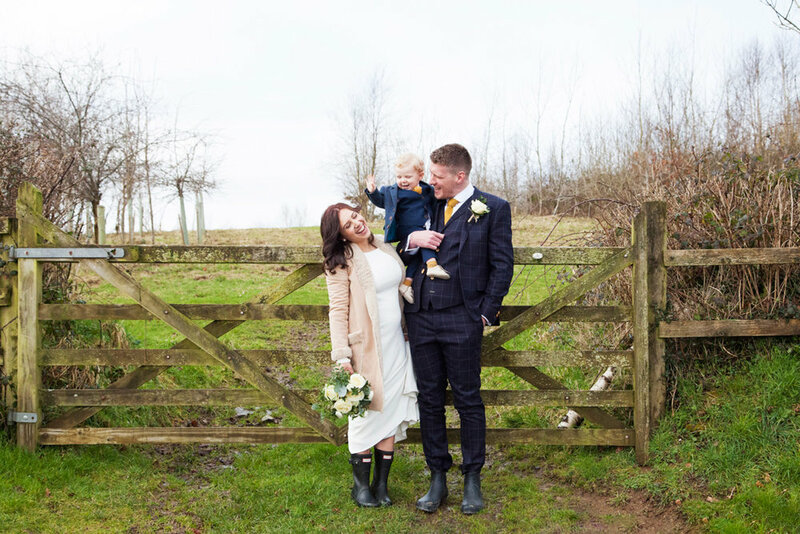 Katie looked beautiful in a long white backless dress and Louboutin shoes, and Colin was stylishly matched to their baby son Noah, in a blue suit and yellow tie. The day went as smoothly as you might ever want with vows exchanged in, 'The Nest' and afterwards with a tour around the grounds for some photo's...I particularly loved the feeding of the Alpaca (scroll down to see). When I arrived at Quantock Lakes to photograph Kath and Larry's winter wedding this February, it was cold & windy, wet, and beautiful. I'd been looking forward to this wedding for some time, and to be meeting Kath; entrepreneur and founder of EcoStardust Biodegradable Glitter, and Larry, formula one mechanic. One of the first things I laid my eyes on arrival was Kath's beautiful 3-piece wedding dress, designed by none other than HERSELF (you'll have to scroll down to see), I was in complete awe. Here's one from last year, which until now I did not get time to blog, as this wedding was photographed during my busiest time of the year-Autumn! The wedding took place at the beautiful Tree Top Escape in North Devon. Hopefully the images will give you a real flavour of the venue and its very private surroundings. I'm very thankful to 2017, it has been an amazing year for me as a wedding photographer, and my busiest yet. Between January and this December I've managed to meet 27 beautiful bride and grooms and encountered some wonderfully talented people within the industry, some of whom I am very much looking forward to working with next year (which is set to be even busier). I've also visited some breathtaking venues, which I will be re visiting next year and excitingly some new ones too! 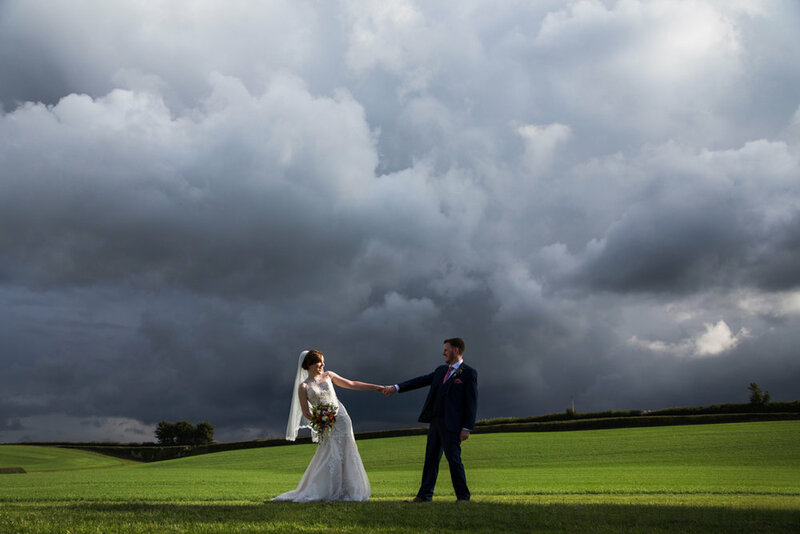 Quantock Lakes was the beautiful setting chosen by Claire and Max for their Autumnal wedding which took place this September, with the ceremony held just minutes away at St Mary's church in Nether Stowey, Somerset. The day was thoughtfully and creatively put together with items such as hand painted glass jars which emanated a beautiful glow later in the evening. The cake was hand made by the mother of the groom and decorated with whole citrus fruits and strawberries (I've never seen this before, I thought it was very unique, and looked sumptuous). The flower arrangements were plentiful and fitted perfectly to the season of Autumn, along with the dried flower petal confetti.